What hasn’t been said about the fourth Nightmare? It’s certainly the “MTV Nightmare,” drenched in a 1980s timestamp that can’t be ignored. One would argue this is when Mr. Krueger jumped the shark and became an icon for one-liners and pop culture references for horror, before Charles Lee Ray took up that mantle. Freddy mania was in full swing. You could snag a talking doll, squirt ball, replica glove, and official makeup. Far from Wes Craven‘s original one shot vision, now a pop culture icon. 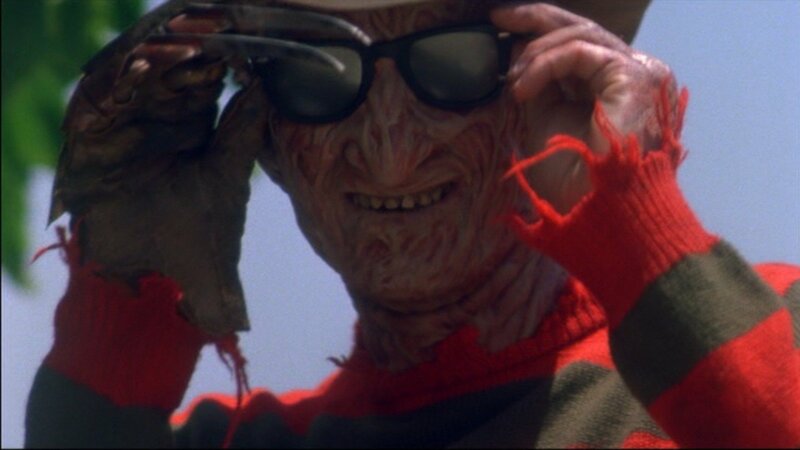 As a film I feel it captures the disdain we have for Krueger as a character, yet champions his anti-hero qualities. A perfect storm, as it were. You want to see Lisa Wilcox‘s Alice triumph over evil yet root for Freddy because he’s the horror icon we know and love. Keep in mind, New Line Cinema at the time just wanted to keep the income rolling, and took a big risk hiring the then not successful director Renny Harlin. The end result was possibly the best follow up to the outstanding Nightmare 3. Your mileage will certainly vary. I’m 35 and spent my high school years discovering the Nightmare series, and have an almost unhealthy adoration of the 1980s. Dim the lights, light a couple candles, order a pizza, and enjoy Nightmare 4. I continue to do so. Just don’t eat during the roach bit. I can’t.